85 days. Brassica oleracea. Open Pollinated. 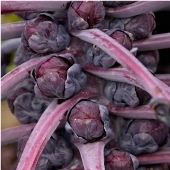 Plant produces high yields of dark red brussels sprouts. The heads average 1 to 1 ½" in diameter. They have a milder, more nuttier flavor than standard green types and are very flavorful. It keeps it dark red color well when cooked, steamed or microwaved. The color improves with colder weather. The plants are ornamental enough for flower borders. Also known as Red Ball Brussels Sprouts. Excellent choice for home gardens. Brussels sprouts are sensitive to temperature, and will produce best when daytime temperatures average about 65 F or less. Consequently, Brussels Sprouts grow best when planted in mid to late summer for late fall or early winter harvesting. Brussels Sprouts are usually planted indoors and transplanted outdoors. Start seeds indoors 6 to 8 weeks before setting outdoors. Spring planting should occur as soon as soil can be worked, and fall planting done around June or July. Plants can grow 2 to 4 ft tall. Requires fertile soil with compost and some lime. Apply much and grass clippings, or straw around base of plant. Keep watered during dry and hot spells. Use RootBlast, Vegetable Alive, and Slow Release Fertilizer when transplanting outdoors. Periodically apply Miracle Gro. Cut cabbage type heads when they are ¾ to 1 ½" in diameter. Pick them before they get any larger. They are not as flavorful when they big.